What is the Tumescent Procedure? All Modern Liposuction is Tumescent Liposuction. How can I get rid of excess fat using liposuction? What’s the maximum amount of fat that can be removed in one session? What are the Chicago Liposuction Advantages? Why Choose Chicago Liposuction by Lift Body Center? With years of experience performing surgery, Chicago’s Liposuction experts get exceptional liposuction results to satisfy each patient’s desire for a better body. Tumescent liposuction is the modern way to sculpt the body into a more perfect form and make it more pleasing to the eye. The tumescent liposuction procedure of today is much safer and technologically much more sophisticated than traditional liposuction. Tumescent lipo patients experience far fewer complications such as soreness, bruising, and scarring than traditional lipo patients. Surgeons only need to make very tiny incisions in the body and often, these incisions can heal without stitches (or scarring). And patients typically report a rapid recovery from this procedure with truly outstanding results. That’s why this modern surgical procedure has become so popular over the past ten years. At the Chicago Liposuction by Lift Body Center, we specialize in providing patients with the most advanced and least invasive liposuction surgical tools and techniques on the market today. As one of the most trusted liposuction doctors in the region, I’ve worked hard to make sure that each patient achieves the body of their dreams. The procedure used for tumescent liposuction at the Chicago Liposuction by Lift Body Center is fairly straightforward. The procedure begins when patients arrive at our facility on the day of their scheduled surgery. Patients are first given a hospital gown to change into. Then markings are made on the body to help the doctor target specific pockets of fat that need to be removed or sculpted. The patient is then given a light sedative to promote relaxation. The sedative makes it possible for the patient to be conscious and aware, but extremely relaxed. In combination with the local anesthetic that’s injected into the target area(s) of the body, the use of a sedative is ideal and a terrific advancement from the use of general anesthesia for liposuction because sedation used alone (with only local anesthetic) makes it possible for patients to move and even talk during the procedure. Patient satisfaction is much higher using sedation because during surgery, they still have muscle tone which makes it easier for the me, the surgeon, to remove the exact amount of fat necessary from precise locations on the body. In days gone by, general anesthesia was the only option available for liposuction surgery, but general anesthesia left patients unconscious, unaware, and limp. Today, by using sedation, I can get much more precise results while ensuring patient safety during the procedure. It’s definitely a win-win situation. Injection of tumescent fluids into the target area happens after the sedative starts working. All of our various liposuction techniques involve tumescent fluids, or fluids that are injected into the body to numb the targeted area and cause fat cells to swell (or tumesce), making it easier for me to sculpt that area of the body with precision and detail. Once the tumescent fluids have been injected, I make extremely small incisions in the skin and insert a long tube called a cannula under this skin tissue to begin the process of suctioning fat cells out of the body. The cannula used to remove fat from the body is very small at only 3 millimeters wide in diameter. I use slow, gentle movements to break up fat deposits and then suction them from the body. Fatty deposits are carefully diminished and sculpted and then, once I’ve achieved the patient’s goals (in terms of sculpting and fat removal) that were set during the consultation, the patient is taken to a recovery area. There’s no need to stitch the incisions up because in most cases, they’re so small that they naturally begin to heal and close within 48 hours. As a result of the tiny incisions, very few patients experience scarring from the procedure*. Liposuction is not a weight loss surgery though some of my patients undergo liposuction in order to jumpstart a diet or exercise program. The beauty of liposuction surgery is that it can be used to target very specific areas of the body where there’s too much fat. What this means is that a surgeon can sculpt specific areas of the body to give them a more proportional appearance in terms of the rest of the body. By re-proportioning the body using liposuction, the entire physique looks slimmer and more pleasing to the eye. Some patients choose to target one area of the body, while others choose to target several different areas of the body during the same surgical procedure, but no matter what, I can only remove 6 to 8 pounds of fat from the body during the same procedure. The reason why is because removing more than this amount of fat increases the probability of serious complications developing. This is why liposuction is best used as a tool for sculpting the body, or as a way for patients to motivate themselves to follow a healthier lifestyle that includes diet and exercise rather than as a weight loss procedure. Advanced liposuction techniques using tumescent liposuction make it possible for patients to achieve spectacular results at a much more affordable cost. The procedure itself is much gentler and safer than traditional liposuction surgery. The downtime is minimized considerably by the combined use of sedation and local anesthesia rather than general anesthesia. 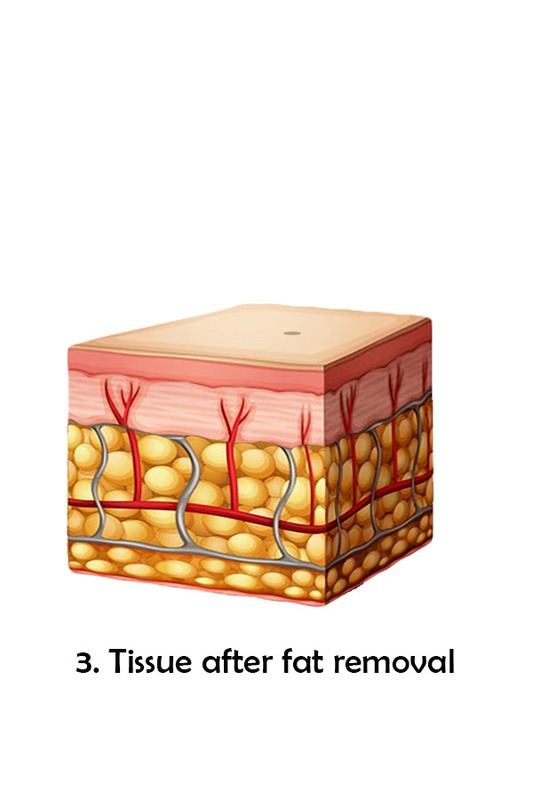 And by injecting the tumescent solution into the fat cells, it’s much easier and gentler to remove them from the body. Some of my liposuction patients can even go back to work right away after their surgery*. The use of high-tech tools and techniques mean less bruising and scarring. Our gentle approach causes fewer aches and pains. Our patients recover and can quickly get back to their daily routines. Our surgical procedures are safer than those used to perform traditional liposuction. We get longer-lasting results by using the most sophisticated tools on the market. For more information about Advanced Liposuction, please visit our liposuction info. Tumescent liposuction offers many advantages over traditional liposuction. One of the biggest advantages of tumescent lipo is that general anesthesia is not necessary. Because tumescent liposuction is so gentle and only minimally invasive, patients need only receive a mild sedative and local anesthesia. By removing the risks associated with using a general anesthetic, patients are much less likely to experience complications related to surgery. And by staying awake and aware, but very relaxed and mildly sedated, patients often get better results overall from the surgical procedure. This is because patients who are only lightly sedated retain their muscle tone which makes it easier for me to sculpt the body very precisely to get the best possible results from the procedure. Recovery from a tumescent liposuction surgery is much easier and faster than recovery from traditional liposuction surgery. But that being said, patient recovery from tumescent liposuction depends very much on how well the patient follows instructions both before and after their procedure. Good nutrition, drinking plenty of water, rest, and avoiding strenuous activities all encourage the recovery process to proceed at a faster pace. Most patients take at least one to two days off from work in order to recover from liposuction surgery. Over the first 48 hours following the procedure, patients take it easy and avoid heavy, strenuous activities. By taking a short break from rigorous workouts, patients can ensure a better, faster recovery from their procedure. Over the first 1 to 2 weeks following their procedure, patients must wear a light compression garment to provide support to the tissues as they heal. The compression garment helps patients heal properly and achieve good results from their surgery. I specialize exclusively in liposuction surgery which means that I have ongoing, daily experience with this procedure and as a result, I have some of the most highly developed skills in this field. While safety is my primary concern, patient satisfaction is what makes me passionate about my work. At the Chicago Liposuction Specialty Clinic we provide our patients with outstanding customer service as well as excellent results that are famous throughout Illinois and the entire region. The Chicago Liposuction by Lift Body Center is a one-of-a-kind facility in Illinois that offers a focused repertoire of high-tech, elite liposuction services.